The Scotiabank Gold American Express card has the best earning rate in the marketplace for many people who put most of their everyday spending on their credit card. It has great earning rates, especially in restaurants category, and a host of travel insurance coverage. Redeeming rewards is very simple. It is an American Express card, so before you apply, you should make sure that the merchants you frequent accept American Express. The Scotiabank Gold American Express card is my favorite card in the Canadian credit card marketplace. When it came out, I noticed it gave by far the best benefits of any card in its class. The main strength of this card is its high earning ability at restaurants (which very few other cards give bonuses to), gas and groceries and its ease of point redemption. I think this is the best card for most people who are responsible with their credit (don’t carry a balance) and put more than $500 of everyday type purchases (gas, grocery, restaurant) on their card each month. 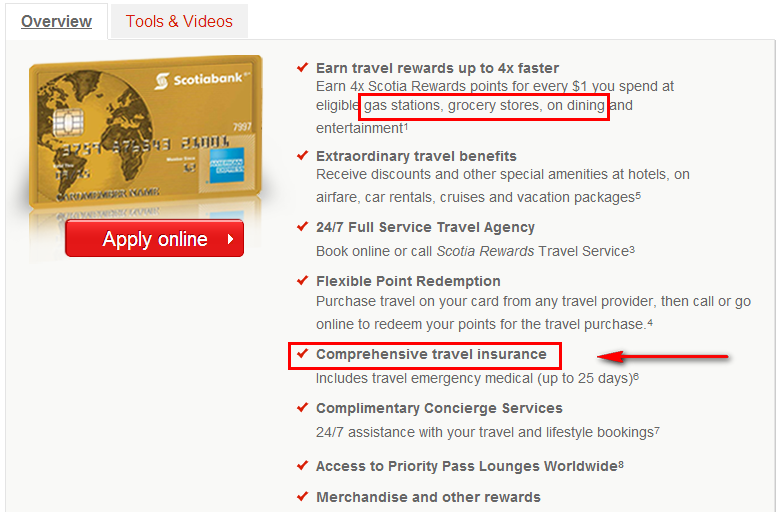 Scotiabank has classified this card as ‘travel’ rewards card, when it is really more of a cashback card. Purchases made with this card earn Scotia Rewards Points. 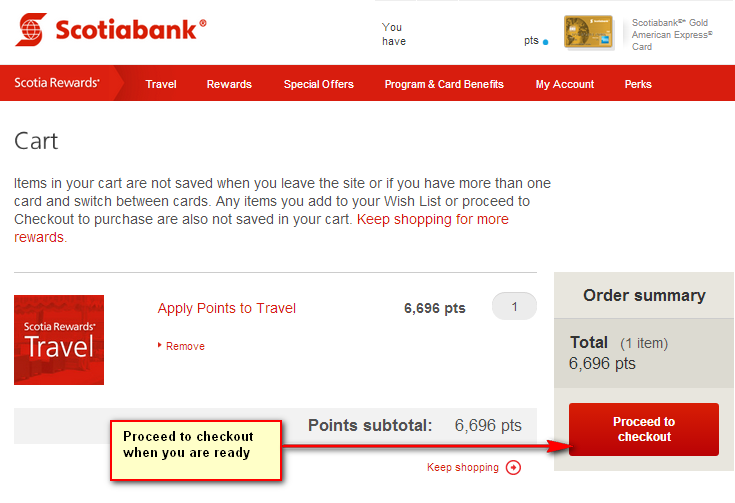 Scotia Rewards Points can be redeemed as a statement credit against a travel purchase. They are redeemed at a rate of 1 Scotia Rewards Point = $0.01, with a minimum redemption of 5,000 pts ($50). I say this is really a cash back card since the value of the rewards points is fixed and will come back to you as a statement credit. You only need a travel purchase to release those rewards from your bank of points. 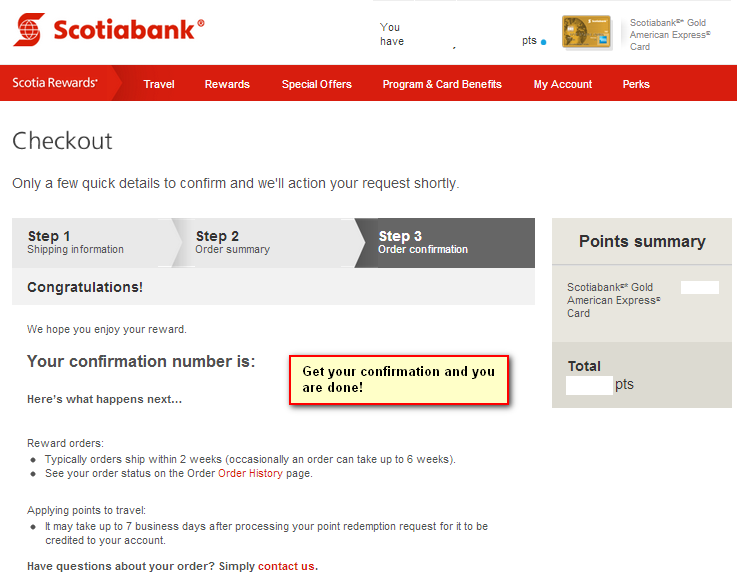 Earning rewards with the Scotiabank Gold American Express card is very simple. You earn 4 pts for every dollar spent at merchants classified as gas, grocery, restaurant / dining establishments or entertainment. You earn 1 pt for every dollar on everything else. There’s no need to transfer these rewards to other programs to redeem, you can redeem them instantly. When you sign up, there are ways to earn extra Scotia Rewards by interacting with the program in various ways. For example, the first item you put in your wishlist will earn you 250 points. 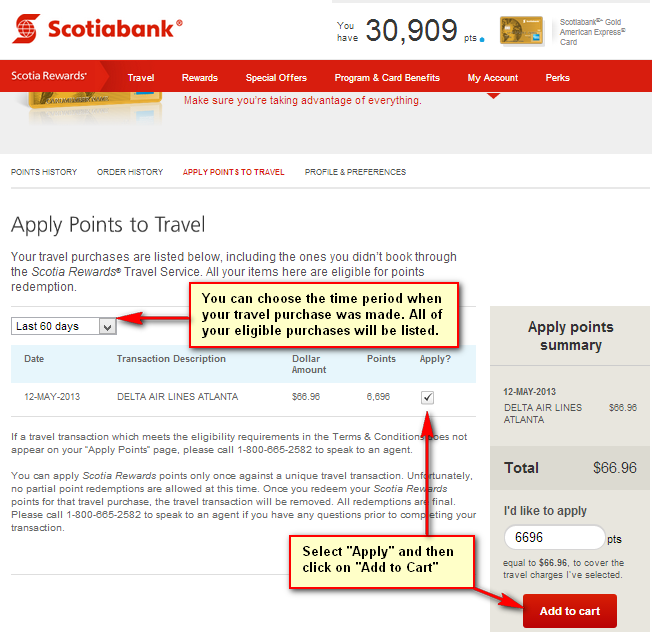 The best use of Scotia Rewards is as a statement credit against a travel purchase. There are 2 options here: purchase your own travel and redeem for a statement credit against that travel or use Scotiabank’s full travel agency to make the booking for you. Redeeming for any non-travel purchase will be poor value. Since many things qualify for travel, you will likely have some eligible purchases on your card that you didn’t realize qualify. The redemption is not restricted to the value of your travel purchase, which makes these points quite flexible. The minimum redemption, however, is 5,000 points, so be conscious of that. It’s simple and convenient. Select the “Travel” tab above to book online or call the full service travel agency at 1-800-665-2582 (option 1). I always like to use my “smell test” to see if any card is reasonable. I say that the standard earn rate should be 1.5% return on all purchases, since everyone can get that from the Capital One Aspire Cash Mastercard, with no annual fee. The Scotiabank Gold American Express card will net you an extra 2.5% return on your spending in the gas, grocery & restaurant categories above the 1.5% that you can already get from Capital One. For this card to be worthwhile, you would have to spend $4800 over the course of the year, or $330 / month in total in the privileged categories to offset the annual fee. You are also getting the benefits of having a gold level card by having the Scotiabank Gold American Express as well. The Scotiabank Gold American Express card does have an annual fee of $99. There is also an additional user fee of $29 should you want that. That $99 fee is probably a little bit below the industry standard of $120 for a Gold level credit card, very reasonable. Sign up bonuses vary, you’ll need to check the link to the card applicatino page for the latest details on promotions, if any exist. This card comes with many of the benefits you would expect on a Gold level card, which is in line with the annual fee. You can also pay $65 each year for Priority Pass, which gives you access to airline lounges for $27 each entry. Personally, I don’t think this is a valuable benefit. If you value the lounge access so much, you should get the Scotiabank Platinum American Express, which has an annual fee of $399 but includes 10 free lounge passes along with a host of other benefits. A few things to note about this card, is that it is an American Express card. You need to look at your own situation and see if the merchants that you frequent accept American Express or not. Another thing of note is that the online access for this card is quite strange. 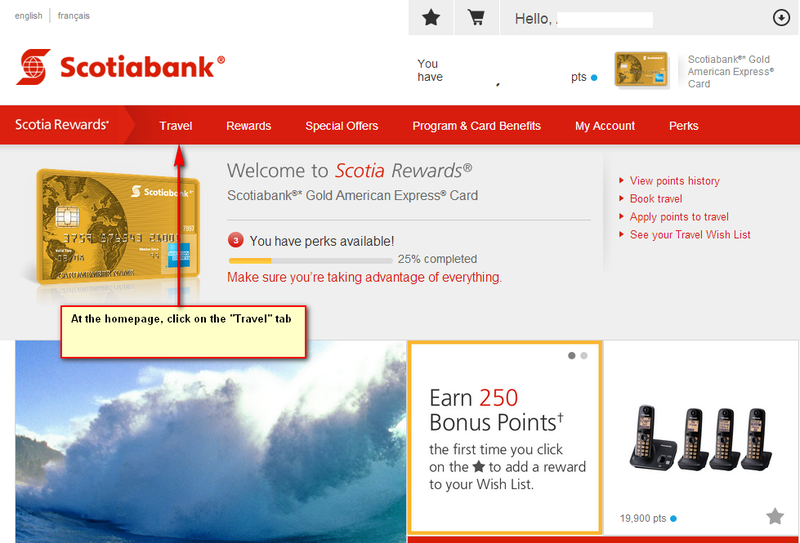 Using the site www.scotiarewards.com allows you to see your charges and even breaks down what category each transaction was coded as. This makes it very easy to see if a merchant you frequent is coded incorrectly, and you get fewer points than you expect. 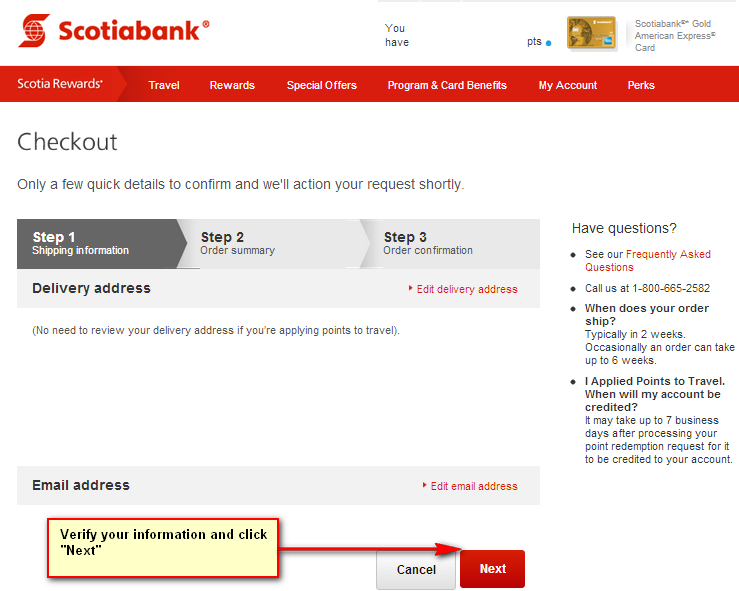 On the other hand, accessing the payment and statement information is through a different site: www1.scotiaonline.scotiabank.com. To register for this, however, you need to have a Scotiabank debit card. These are free, however, it is noteworthy that there is an extra step in setting up your online credit card access. The Scotiabank Gold American Express card has the best earning rate in the marketplace for many people who put most of their everyday spending on their credit card. Combine that with a signup bonus that more than offsets the first year annual fee and a host of Gold level benefits, and this card can’t be beat in the Canadian credit card marketplace. This card has a great earning rate of 4 pts per dollar spent at restaurants, grocery and gas establishments. Dining is usually not a privileged category and if you have a lot of spending in this category, this card definitely makes a lot of sense. The sign-up bonus and travel insurance coverages are more than acceptable for a card of this level. The only real knock to this card is that it uses the American Express network, instead of a Mastercard or VISA network. That means that there are going to be places that don’t take this card. The online statement access is a minor issue but should still be considered an annoyance. I definitely agree on that one. Thanks for pointing out the unbelievable interest rate. I tend to ignore the interest rates becuase they are always too high adn you dont have to pay them if you pay off the balance every month. If you are using your credit card to carry a balance, then the Scotiabank Amex is definitely not for you. 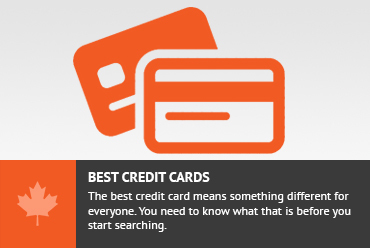 In fact, most credit cards are not going to be for you. Since the interest rate on most credit cards is much higher than you can get from a normal Line of Credit from a bank, you shouldnt use your credit card as a loan vehicle. The Scotiabank Amex card is a great solution but you cant use it as a loan vehicle. The Telephone Number you have posted is incorrect. Dialing 1-800-665-2582, Option 1 is for ScotiaGold Passport VISA Cardholders. If you actually dial the number, the travel agent will transfer you to AMEX Rewards. Option 1 is for credit card holders who have the card starting with the numbers 4538. Thanks for letting me know. The card that I have starts with 3792. On the back of that card, the number is 1-888-860-7093. I am willing to bet that if you call that, they will send you to the right place. Personally, I would never even use that option. I think it makes sense to just buy your ticket from Expedia or Travelocity or whoever. You can get some referal credit through eBates fro example this way. Also, you are much more free to book whatever you like. my only experience in redeeming has been against travel charges that were the tax portion of an award booking. Those went through just fine. If you prefer the calling in method, then I think calling the number on the back of the card might be the better way to go. Excellent review. I am worried most of my actual purchases are not at amex 4:1 locations – and may not even take amex (lowbals, shoppers drug mart, local shops). Here is a list of “Popular Canadian Merchants* That May Qualify For Accelerated Scotia Rewards® Points”. Will decide between BMO Elite and Cap1 Aspire and ditch my useless CIBC aerogold. Really appreciate this blog/article, as I am searching for the right travel rewards card at the moment. This is such a clear, succinct article! Just to let anyone reading this know – I was talking to a Scotiabank employee about this card and the promotion recently. I told them about my reluctance at getting an AMEX card, as I am aware that many places do not accept it. They informed me that you can get a companion card with Scotiabank that is a VISA. This card enables you to still earn your travel rewards, as they feed into the same account. This card has no annual fee and has the same interest rate. So, as I understand it, it is like having one card, but you have an additional visa for those places that do not accept the AMEX. Hope this helps!! I’ll have to investigate this. I think there are cards such as the Scotia rewards visa that might be what they are suggesting to you as points earned from this card are Scotia rewards, the same as the amex. The earning on that card is very weak at 1 point for $2 spend or 0.5% return. If this is the card I wouldn’t suggest it as there are free mbna cards and free capital one cards that get much better return in cash than 0.5%. Those get much better return but if you are really interested in combining your rewards then a Scotia card makes sense. I’ll investigate if there is a free visa that gets a reasonable return and earns Scotia rewards as a new product. Thanks for the point of reference and hopefully there is a new product to match the gold amex. Thank you for replying. I really hope you can find out if this is the case, or not. I would love to know, as I am not an expert (merely a student) and I would like to know if this is the best choice for me! For anyone considering applying for this card, I would strongly encourage you to look elsewhere. I have had this card since January of 2014 and just attempted for the first time to use my reward points to book a car rental. When I went to book the car online for what I thought was a good price, the Scotia Amex travel rewards website went down and I couldn’t book. I wanted to lock in this price so I phoned the so-called help desk. All the staff there actually do, is go on the same website as customers and book the same way you would. Obviously she could not book the car either (I should also mention that this was the second customer service person I spoke with – the first one seemed to barely know how to use a computer). After she said she could not book the vehicle, I asked for the manager to call me back the next day, which she did. She said they were working on the website and she would again have someone call me when it was working. Apparently it took their IT department almost 3 days to correct the website problem. During this time, the price of the vehicle I had tried to book went considerably higher. The manager then sends me an email saying they cannot honour the price I had tried to book some days prior “as the prices change frequently”. I’m not sure how relevant that information is when I tried to book a vehicle but could not due the companies website being out of order. How is that my fault? She pretty much said I was just out of luck, but I was welcome to try to book something else. Hands down it was the worst customer service I have ever experienced. The entire reason I applied for this card was for the travel rewards as I frequently travel to the US. American Express: you should seriously reconsider your relationship with Scotiabank, they are a joke. After my next trip in November, this card will be promptly cancelled and I will never look at American Express or Scotiabank again. Thanks for sharing your experience. It is always great to have stories of what works. Now we know to avoid the Scotiabank booking engine. Personally, I have never encountered this problem as I never use their booking engine. 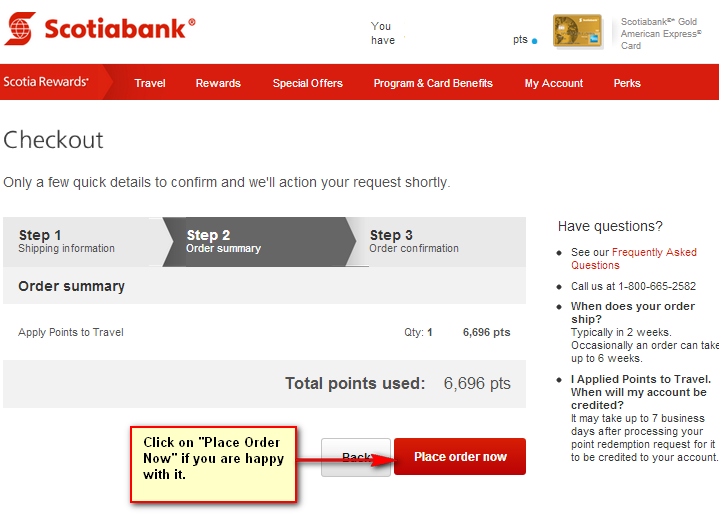 What I do is simply book my travel as I want, completely independent of Scotiabank. Then after the charge has shown on my statement, I simply choose the “use points to pay for previously purchased travel” and use the points that way. You get the exact same value out of your points (1 pt = $0.01) and you can book with whatever engine you want. 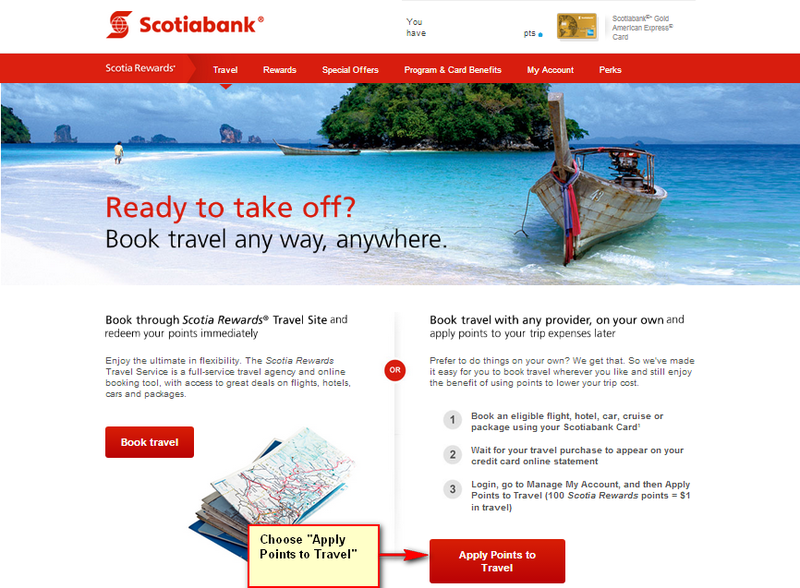 You don’t need to worry about Scotiabank’s booking engine at all. Further to my discussion above, in fact, one of the reasons I like this card, over say the BMO World Elite card is that I don’t have to use the Scotiabank booking engine. I can use whatever engine I want, and actually get another benefit such as linking through eBates for some extra cash back. I think one of the selling poitns (that I value) about the Scotiabank Amex is that I don’t have to use their booking engine (and I dont). This allows me to grab whatever the best deals are from anywhere selling travel, not only what Scotiabank’s travel site can see. Yes, I have decided to bypass the Scotia site altogether and just booked the vehicle on my own. Customer service is a big issue for me and I certainly don’t feel the need to hang onto cards where I have received bad customer service. I can just see me trying to get the points value back, there again is an issue and having to deal with these people again. I have actually decided to get a VISA Avion instead. I know several who have and really like this card and its benefits. Finding places in Canada to use Amex is annoying anyway, it’s amazing how many places still don’t take it. It’s accepted any where else in the world, just not everywhere in Canada. Go figure. Thanks for the reply. It definitely does depend on what you spend on – as a person who likes to travel, my annual spend breaks down to be much higher than gas/grocery/restaurants – so I get it. It gets a little confusing when you break down annual spend vs. monthly…that’s where I think people have a tough time. If you think about it…a weekend away in New York for 2 people will run you a couple of thousand bucks. Do you know on average how much Canadian’s spend in these areas? I did check out the BMO and MBNA World Elite and my beef with that card is that I can’t use my points however I want if I find a better deal than their travel agent. Even CapOne’s scheme when using your points isn’t clear…a bit of a turn off. I guess to me, it isn’t just about pure return, but being able to use my points however I want although I’ve had good experiences with Expedia for TD. Anyhow, thanks for responding…no doubt a different flavour for everyone! Definitely a different flavor for everyone. I do hear you on the wanting to be able to use the points on the trips YOU want to take. If BMO’s engine doesnt get you the flight you want or at the price another engine gets you then is it really a 2% return? I would say no. This is why I like the MBNA World Elite. They have hte “pay me back” feature of their points and you also have the option of taking the cheque, so ti truly is 2% return. I personally prefer cash return to any other restriction because I know the value and I get all of that value out of it. Some people prefer to have the points pay off a trip so the trip is “free” adn I see how a trip that feels like it was “free” can be that much more enjoyable. So I guess it is different folks for different folks on that front. In terms of a trip to NY, I hear that on the high costs. Personally, I have friends there and that saves me a lot of $. I think this has skewed how much I value a trip to NY. Accomodations can be a killer there. I imagine that you are right at a trip to NY could cost a couple easily $1500 or $2000, when you factor in hotels and flights and everything on the ground. I guess in my head, a trip to NY costs some BA Avios (I got from card signup bonuses) + $50 taxes / person and dinner for the friend(s) I stay with. Very good article and the overall information on the site is well put together. Thank you for doing this! I have the Scotia Amex Gold and use it for grocery, gas, dining which are our major variable expenses (4%). Also have the BMO World Elite which we use for everything else (2%). Have used the Scotia Amex for reward bookings – all worked fine with the pricing almost the same as other booking engine sites. Also used the BMO World Elite site for flights with WestJet and Porter and again, no issue. I agree with the annoyance of having to pay an annual fee for a second card. I am in a similar situation. I think I am going to have the sig other just get a new account and take the sign up bonus there. I have never experienced any of these issues, however, it is not unreasonable that you might have. Canadian banks are not known for very good customer service. Given you had a bad experience and I had a good one, I dont know which is the norm and which is the outlier. The scotia rewards website was not very clear when explaining how to redeem the 20,000 sign up bonus. How long after spending the 500 in the first 3 months can I expect to receive the 20,000 points? You should receive it within 3 months, i believe. I think it actually should be in your account much sooner than that though. Login to scotiarewards.com to check your balance and redemptions. This is not the same site you use to manage your account. Don't subscribe All Replies to my comments Notify me of followup comments via e-mail. You can also <a href='https://www.creditwalk.ca/comment-subscriptions/?srp=995&srk=2648578ecea05c83754707575dc5a494&sra=s&srsrc=f'>subscribe</a> without commenting.